Steve Ballmer was always a very passionate CEO and therefore his last meeting had to be one that everyone remembered. He has mentioned that he would leave Microsoft, and he is making this last meeting something that we are all going to remember. Steve Ballmer has been at Microsoft for 33 years, and all that love for the company was let out at this meeting. Steve let out a very emotional saying right before he let out tears while on the stage. “Soak it in, you work for the greatest company in the world,” Ballmer screamed on stage as his eyes welled up with tears. Ballmer has always loved the company, and the people in it. Even after all these years that love for the company is still strong even after he leaves the company. His speech was very emotional, and The Verge has the exclusive video which you can see right below. As you can see the speech was very heart felled, and it leaves us with questions like. Who will take his place, what will be the future of Microsoft. The company has made questionable moves, and Steve Ballmer was a CEO that you either loved, or you hated him. People loved what he did with getting Microsoft, into the mobile market, but they also hate him for Windows 8 and questionable business moves like making an RT and a PRO version of their Surface. This was arguably the worst decision he made since it made no sense to anyone. 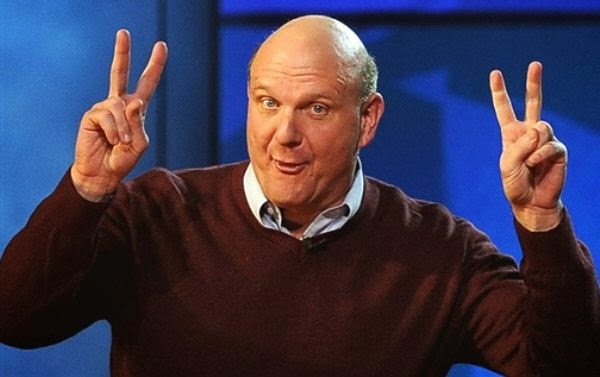 Microsoft will have a bright future after his leave, but for now lets all bid farewell to Steve Ballmer and his work at Microsoft.